In the first part of our deep dive on dynamic blocks we explored the benefits of dynamic blocks, how they are created, and how to use parametrics to drive the dynamic block configurations. In this post lets look at an alternative to parametrics… parameters and actions. Parameters and Actions actually came first. 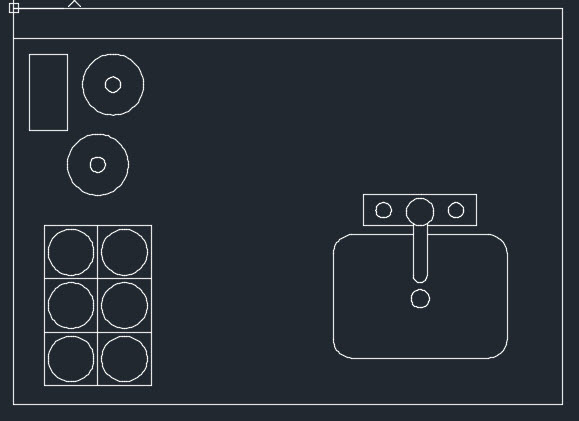 Before AutoCAD had parametrics, this was the only way to create dynamic blocks. Using Parameters & Actions has pros and cons and when to use this over parametrics is really based on the situation, the geometry, and the desired results. Think of Parameters as the nouns, defining the subject of the change. The Actions are the verbs, defining what’s actually going to happen. Parameter Sets are just the combination of specific parameters and actions. “Canned” shortcuts to simplify the process. 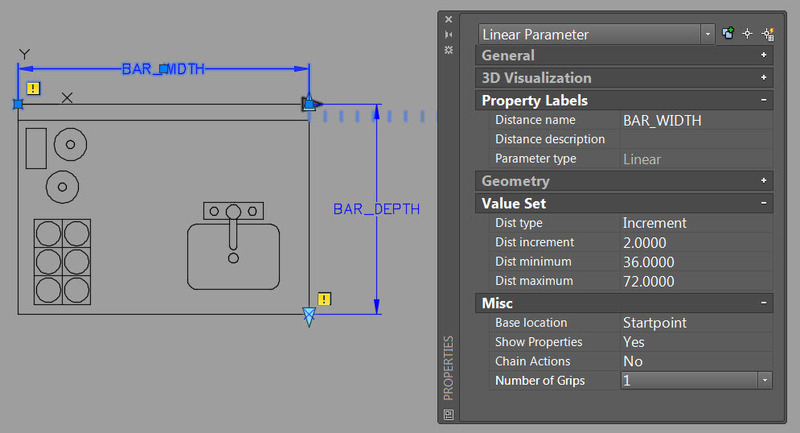 To set up the block to allow the stretching of the width and depth we require two Linear Parameters. The act of applying the Linear parameter is similar to adding a linear dimension… pick two points and then the location for the parameter. Order here is important, but only if you want one grip to appear opposed to both ends. Don’t be concerned about the yellow exclamation marks at this point as these are warnings that there are no actions associated with the parameters yet. To see this just roll your cursor over one of the yellow symbols. If we try the block at this point the grips so not appear, however, before we assign the actions lets explore the parameters properties. The name Distance1, Distance2 really doesn’t mean much…. plus if we end up with multiple Linear Parameters it will get confusing on what each one is controlling. 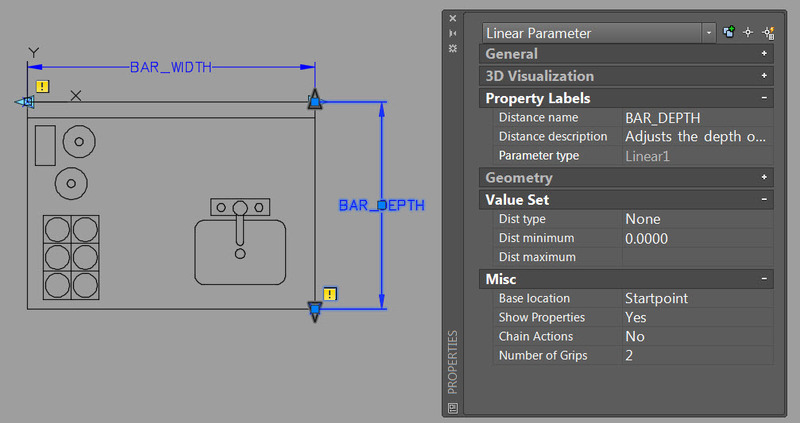 Using the Properties Palette I’ve adjusted the Distance name to be Bar_Width and Bar_Depth. I’ve also appended Distance descriptions to help explain the parameters purpose incase I am not always the one making changes. As a bonus the description will appear as a tooltip for anyone using this block. Using the Value Set section I will apply an increment restriction so that the Width can only be adjust in 2-unit increments. The minimum will be 36 (the current width) and although optional I will set the max at 72. With the Depth I will configure a List with the options for 26, 32, 48. and 62. Now that we’ve decided how we want it to change lets actually make it do something. 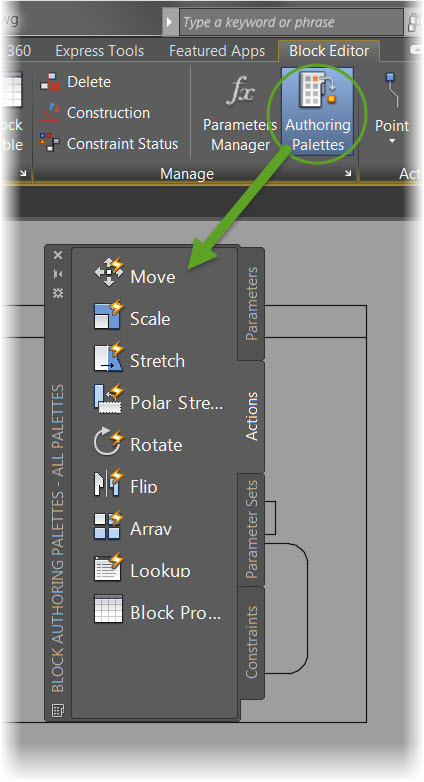 Switching to the Actions tab on the Authoring Palette I see many options, but in this case I want to apply Stretch. 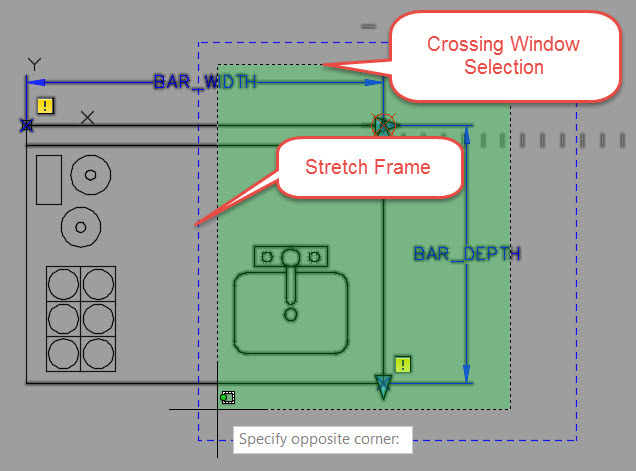 This highlights one of the advantages of parameters / actions over parametrics, I do not need to worry about constraining and dimensioning each and every object involved in the action, a simple crossing window will take care of it. Select the grip to apply the action. The Stretch Frame does not define the objects to be stretched but the parameter and grips that are required for the stretching action. It can be selected as a window or crossing. As this is a stretch action any object you want stretched and not moved needs to be selected by a crossing window. After applying the stretch to both parameters we’re ready for testing. 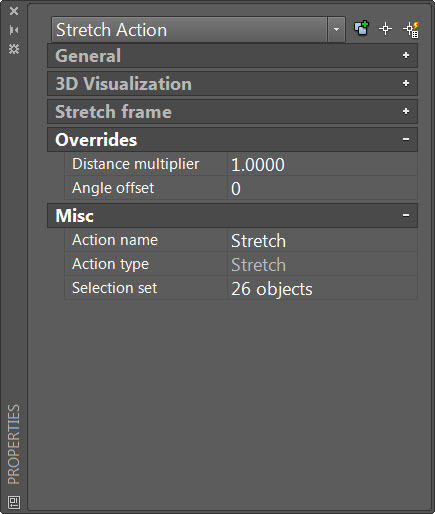 I do not need to apply the stretch action to both ends of the parameter as I already reduced the number of grips to 1 and I only want the user to adjust it in one direction. What about Actions and their properties? The Action Name is a good idea to change, especially as you could end up with many actions in the dynamic block and without proper names it may be difficult to determine the one to modify. 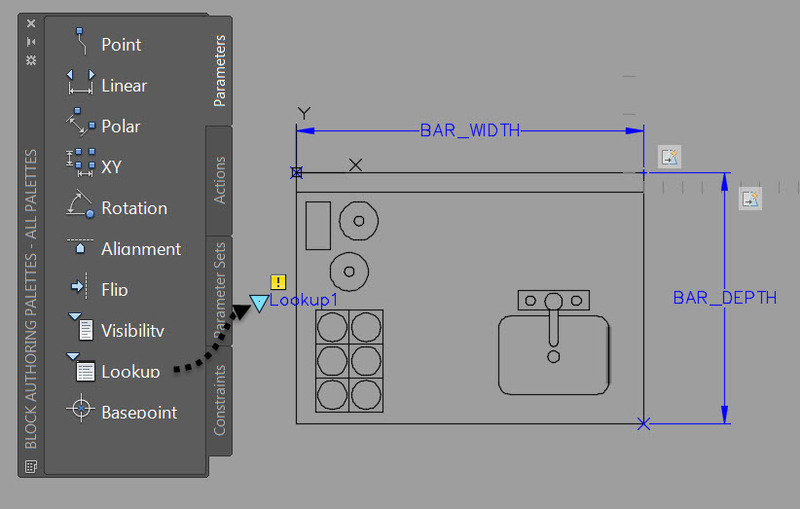 The Selection Set is a method to alter the objects included in the action, both add and remove. 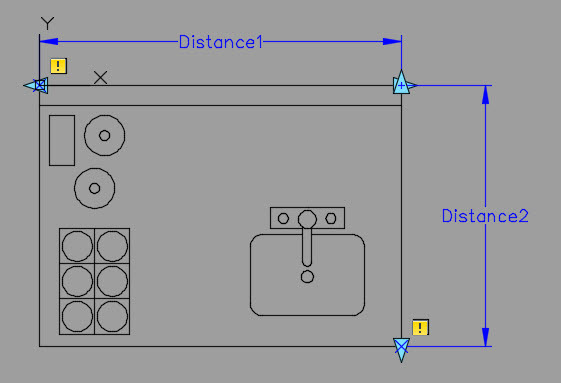 The Distance multiplier and Angle Offset do as they describe, override the amount the action applies to the selected objects. 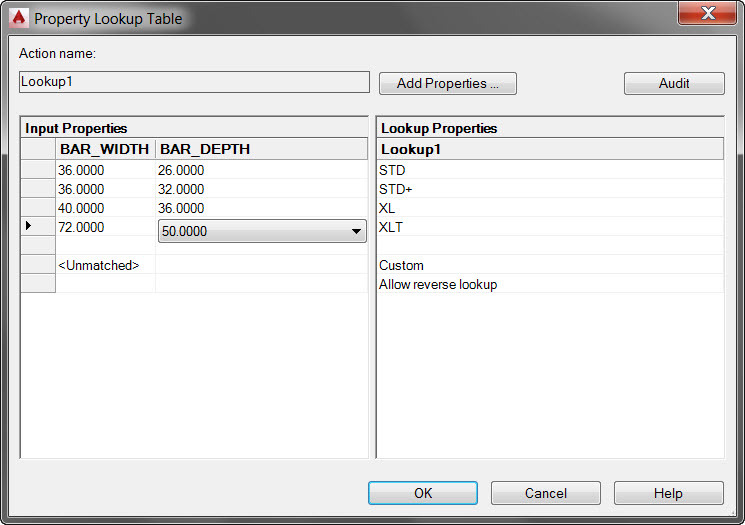 The way the Property Lookup Table works is the parameters you wish to control are added (via Add Properties) to the left side of the dialog. The size combinations are set here. On the Right side the name of the configurations are set. This is text which can be whatever you want. The result is something like this…. 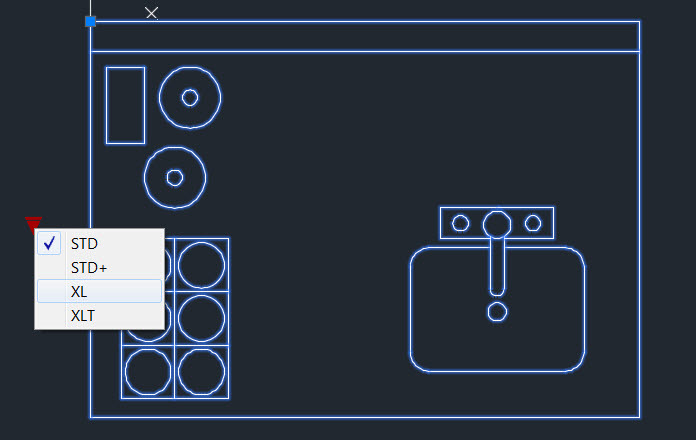 The One AutoCAD Feature You Need to Be Using Now!